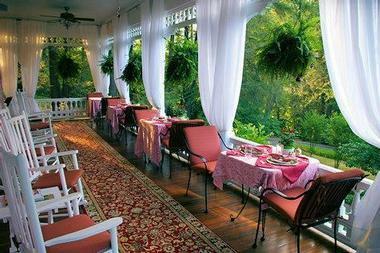 Located a mile south of downtown Asheville, NC and just a short stroll away from the famous Biltmore Estate, the Cedar Crest Inn is an inviting bed and breakfast that offers a comfortable retreat. Set on a meticulously manicured property with beautiful gardens, the Inn features traditional bed and breakfast accommodations, delicious home cooked cuisine, and modern conveniences. 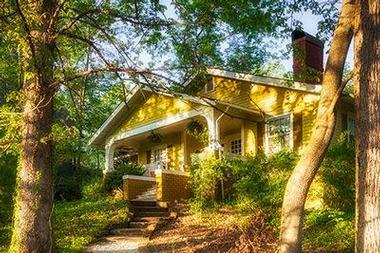 The Cedar Crest Inn is ideally located for exploring the delights of Asheville and the Biltmore Village. The Inn is a mile away from an array of restaurants, cafés, shops, galleries, and museums and four miles away from The Blue Ridge Parkway. The Cedar Crest Inn offers a range of accommodations from comfortable guestrooms and suites to private cabins, cottages and guest houses. Named after the second owner of the manor house, Arthur F. Reese, the A. Reese Study Room features a comfortable queen-size bed and a second twin sleigh day bed, a full master bathroom with claw foot tub iron and shower combination and a half bathroom in the entrance hallway. This suite is located on the ground floor of the main house and enjoys its own private entrance. The A. Reese Study Room also has access to a study/sitting room next door, which features plush reading chairs, sofa, and a cozy fireplace. Located on the second floor of the main house, the Eastlake Room is a large sunny room with a queen-size bed, a private bathroom with a Victorian claw foot tub with bath/shower combination and a cozy gas fireplace. Named for its romantic Juliet window balcony, the Romeo and Juliet Room is set on the second floor of the main house and offers a delightful room with queen-size bed, antique vanity and private water closet with a stall shower and toilet. Sunny and bright, the William Breese Room is named after the home’s original owner and builder and features a beautiful canopy queen-size bed, a cozy gas fireplace and a private bathroom with a shower stall and pedestal sink. The glorious Queen Anne Bedroom is located at the rear of the main house and features a king-size bed, Victorian-style décor, and a gas fireplace. A private bathroom has an antique cast iron tub, and shower combination and the spacious room has a stunning dramatic draped ceiling. Located on the second floor of the main house, the Garden Room offers lovely views over the rear gardens, a queen-size, four-poster bed, and a private bathroom with a Victorian claw foot tub with shower combination. The Page Bedroom is set on the third floor and can accommodate up to three people with a king-size bed, a twin roll-away bed, and a private bathroom with a stall shower and pedestal sink. 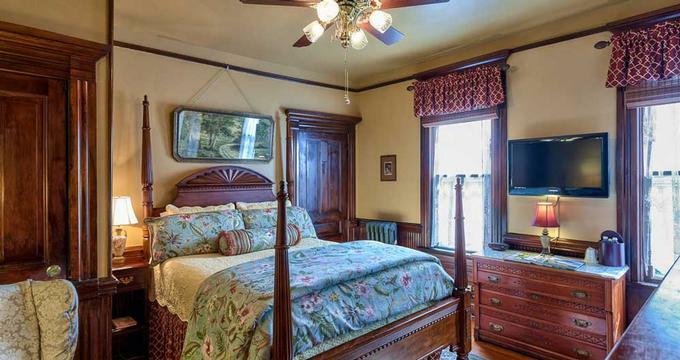 The Tower Bedroom offers extra levels of privacy with a separate entrance foyer leading into the bedroom, which has a large turret bathroom with a cast iron, claw foot tub, and hand-held shower. 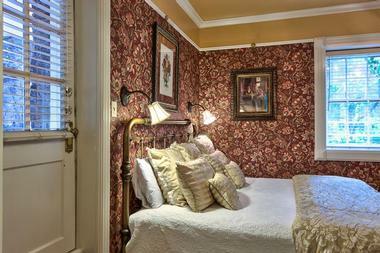 The bedroom features a king-size bed and a twin size roll-away bed and can accommodate up to three people. The Celebration Suite boasts two sunny rooms connected by a private foyer and shared bathroom a jetted tub/shower combination. The first bedroom has a king-size bed, reading chair, television and lovely views of the rear gardens, while the second bedroom faces the front of the house and offers a queen-size bed, reading chair, and television. The wonderfully secluded Serenity Suite enjoys a large private veranda and separate entrance on the garden level of the mansion. A spacious sitting room features a romantic love seat, full-size sleeper sofa, mini fridge, and coffee-maker, while the bedroom has a king-size bed, a gas fireplace, and a private bathroom with a jetted bathtub and rain shower. For those wanting privacy and seclusion, the Inn has fully furnished and equipped guest cabins, cottages, and houses that can accommodate up to six guests. These luxurious lodgings feature multiple bedrooms with double, queen or king-sized beds, private bathrooms with walk-in showers and cast iron bathtubs, spacious living and dining areas with plush décor, fireplaces, and dining tables and chairs. Fully equipped kitchens contain all the appliances and utensils needed for comfortable holiday living, and front and rear porches and verandas are ideal for relaxing with a book. Modern amenities abound, including flat screen televisions, mini fridges, coffee makers, telephones and complimentary wireless Internet. The Cedar Crest Inn offers a variety of premium amenities, including a three-course gourmet breakfast, free parking, reception and concierge services, and complimentary wireless Internet. Guests staying at the Cedar Crest Inn are treated to a delicious three-course gourmet breakfast every morning, which includes hot and cold selections, freshly brewed coffee and teas and fresh fruit. The Inn does not serve dinner, however, there are several excellent restaurants within walking distance of the Inn. The Cedar Crest Inn offers elegant and effortless small wedding and elopement packages from private, intimate ceremonies for two, to wedding parties for up to 150 guests. Customized wedding packages include luxury accommodation at the hotel, private ceremonies in a variety of indoor and outdoor venues, and wedding planners to help with all the details.